We went to Rancho Los Pinos on Thursday for story hour. 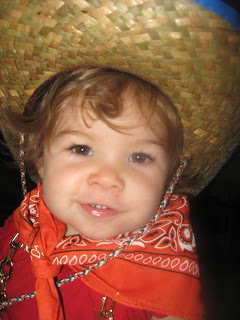 The program sponsors had kerchiefs and hats for the little ranch-hands, but I knew Bella would NEVER allow it. However, as soon as she saw that the other little people where rocking their cow clothes, Bella was willing to try. Unfortunately, the one time my child allows a hat to remain on her head, it's the time I forgot my camera. It didn't last too long anyway. By the end of the hour, she had cast the hat to the side and was busy trying to climb onto the picnic tables to stick her grubby hands into other people's cups - just like my regular girl. Underneath the cuteness, though, I learned something. Bella is willing to go with the crowd - but only if I give her a crowd to go with. This is another tick mark in the "Pro Daycare" column. Who knows what she'd come home doing or saying after spending a few days with her peers! Somebody got a haircut tonight!